The Eezy S Twist is a new lightweight stroller from Cybex with unique rotating seat and super compact fold. It’s designed for on-the-go parents who like to run errands and travel. Navigating crowded city streets and tight spaces will be a breeze since the Eezy S Twist has a very narrow frame of only 18″ wide. This also allows it to have a compact one-hand fold that is close to a very popular carry-on compliant Babyzen Yoyo+ model. Now, I am not sure if Eezy S Twist is small enough to be on board. You will have to check with the airlines. To reverse the seat all you need to do is twist it without disconnecting it from the frame. You can even have your child in the seat while doing so. While weighing only 13 lbs, Eezy S Twist is car seat compatible and can be turned into a travel system with Cybex and GB car seats. The almost-flat recline allows for comfortable long naps and quick diaper changes. For your newborn you can also get a newborn nest that goes right into the reclined seat. Despite the light weight, the stroller can accommodate a child up to 55 lbs. It also features medium size canopy, good size basket, flip-flop-friendly brake, all-wheel suspension, standing fold and auto lock. The 5″ wheels are designed for flat surfaces and don’t do well on rougher terrain. It doesn’t come with any accessories but you can purchase them separately. It’s early to say how popular this model will be among the parents, but it’s definitely one of the most interesting models this year. This unique buggy comes in 5 colors and retails for around $299. -Medium size canopy. The canopy has two UPF 50+ panels and a small pop-out sunvisor for additional coverage. I wish the panels where a little bit larger to provide more sunshade. There is no viewing window on top. I would like to see dark mesh window added. -Rotating seat. The seat is very roomy and should fit an older child with no problem. The seat weight capacity is 55 lbs and it has a tall canopy. This unique seat can be also reversed by just twisting it around. No need to remove it from the frame. You can even leave your child in the seat. How cool is that? The seat has an one-hand strap recline that goes almost to a flat position suitable for a NEWBORN, but Cybex recommends using the seat only from 6 months for some reason. The seat can accommodate a child up to 55 lbs. If you want to put your young baby directly into the seat, I would suggest getting some kinds of infant insert for extra support. Another option for the newborn would be converting it into a travel system or using it with the bassinet. All materials are machine washable. -5-point harness. It has an adjustable padded 5-point harness with a center release buckle. -Non-adjustable handle bar. The foam covered handle bar is not adjustable, but is average height at 41″ from the ground. -Medium size basket. The basket is pretty roomy comparing to other lightweight strollers. Definitely larger than on umbrella models. You will be able to fit medium-large diaper bag with no problem. Because of the frame design, it’s easier to access in the front since the back is slightly narrower. Because basket it the only storage, I would suggest getting an universal stroller organizer that attaches to the handle bar and can hold your coffee cup, keys, phone and other small essentials. -Wheels. It rolls on four hard rubber 5″ wheels. The front wheels are swivel, but just like on Babyzen Yoyo+ don’t lock straight. The Eezy S is designed for flat surfaces and not going to tackle terrain very well. -All-wheel suspension. The all-wheel suspension might not be as robust as on joggers, but I definitely helps to smooth out the bumps. -Flip-flop-friendly brake. It’s always nice to see a flip-flop-friendly brake. No shoe scratches! -One-hand fold. You can fold the stroller with the seat attached facing any direction. Now, they do advertise it as an one-hand fold, but in the last step you will need to press the stroller together to activate the auto-lock. I guess you can do it using one foot and one hand. It does have a standing fold and an auto-lock. It does fold to a compact package of 9″L x 18″W x 21″H, but I don’t think it’s small enough to pass as a carry-on, but you have to check with the airlines first. Cybex does advertise it as hand luggage compliant. For comparison, famous Babyzen Yoyo+ which is definitely compliant is 7″L x 17″ W x 20″H when folded. -Newborn nest option. If you want to use the seat from birth, you can add a warm matching newborn nest to the seat. -Travel system option. You can also turn your stroller into a travel system by using GB or Cybex infant car seats. 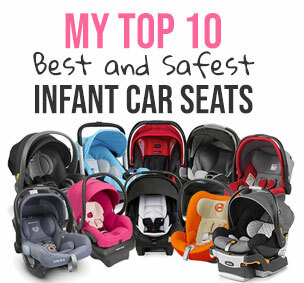 BTW, Cybex car seats are one of the best and safest on the market. I highly recommend Cybex Anton Q or Cybex Could Q. -Works only with Cybex and GB car seats. While you can convert Eezy S Twist into a travel system, it works only with Cybex and GB infant car seats which I love, but they are not cheap. And what if you already have another car seat? -High price. I guess if this is your ONLY stroller the price wouldn’t be an issue. But, for parents who already have a few other strollers like a jogger and a full size travel system paying over $600 for a lightweight stroller might be too much. I wish it was around $300. -Small wheels. As with most lightweight models the wheels are small and can’t tackle much of the terrain. -Non-adjustable handle bar. I wasn’t expecting an adjustable one on a stroller that weighs only 13 lbs. Here is a video overview Eezy S Twist. The Cybex Eezy S Twist is available in five colors: manhattan grey, rebel red, passion pink, denim blue, and black. All models come with a black frame. You can get Cybex Eezy S Twist in one of the five beautiful colors for around $299 (free shipping). You will have to purchase all accessories separately. BTW, I would skip the cup holder and get an universal stroller organizer instead. That way you can take not only your coffee cup, but also a LOT of stuff including keys, phone, water, wallet, snacks, diapers, toys, and more. The amount of stuff I can fit into this organizer is unbelievable. And, the best part is that I can use it on ANY of my strollers. The Ethan & Emma organizer is my favorite so far. P.S. If you have any questions, leave me a comment below and I do my best to answer them as soon as I can. Does it come with the adapter or it is sold separately? When is this stroller available? And is it $600 or $300? How is the push in comparison to yoyo? I find that yoyo has one of the best pushes of any stroller, regardless of size. Yoyo glides over cobblestones and cracked pathways. Does eezy s twist handle similarly? Hi Susan, do you think that the lack of a proper footrest & relatively shallow seat would hinder a child from getting a good sleep in it? I’m looking to buy just one stroller and my criteria are – reversible & travel size! So, options are really limited. Was looking at the baby jogger city tour lux but some reviews complained that the canopy wouldn’t stay in place. Thanks! is it washable in the washing machine? is it good for steps? Hi, is it available in the US? Thanks for the great review!!! I am torn between the agis m-air 3 and the eezy twist. Any thoughts? I want something lightweight and easy to handle but that integrates easily with a car seat. When home I drive basically everywhere! Just another quick question. Your review says the stroller is 13 lbs. However, the Cybex website lists it at 7.7kg which is more like 17 lbs. Could you clarify on that? Thank you! I’m reluctant to pick between Cybex Eesy S Twist and Babyzen Yoyo 6+. Can you please kindly suggest?